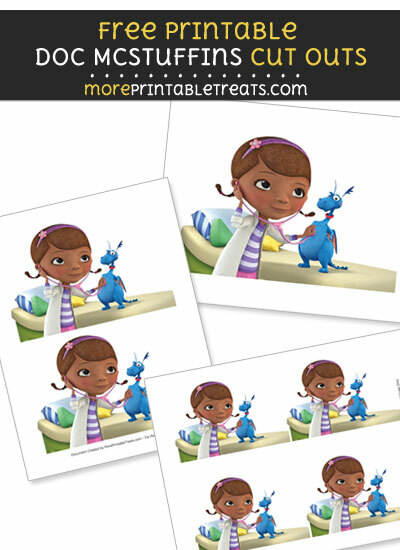 Download this super cute Stuffy McStuffins doctor check up printable cut out that you can use for your Doc Mcstuffins themed party or classroom decorations or whatever you like! In this download you’ll receive one PDF file of three pages – all featuring the cute little blue dragon stuffed animal having his heart listened to by Doc McStuffins. The graphic quality in this file is not great. It is a little blurry but still suitable for some types of projects. A page with one large Stuffy and Doc McStuffins image. A page with two medium-sized Stuffy McStuffins clip art. A page with four small Doc McStuffins graphics. Please note that the characters shown in this post do not belong to me and are copyright of their respective companies. These files are in PDF form and will download in a zipped folder. You will need Adobe Reader in order to open the PDF file.